This is my mom’s recipe for dill pickles. You can slices them for sandwiches or leave them whole. The jar on the left was just made and still needs to go through it’s curing stage. The jar on the right is done and is ready to eat. 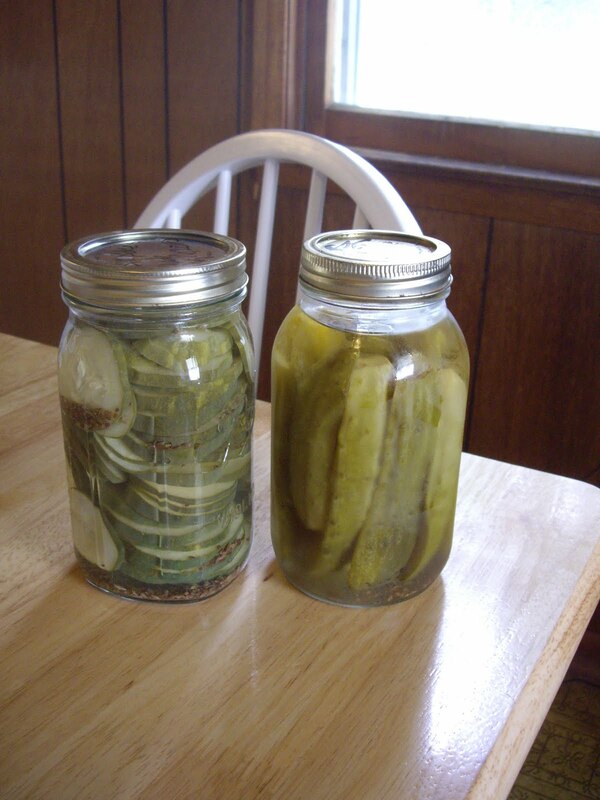 Fill your sterilized jar with cucumbers. Add the dill set. Put the water, vinegar, and salt in a pan and bring to a boil. Pour over the cucumbers and dill seed. Carefully pour the vinegar mixture back into the pan, making sure cucumbers stay in the jar. Placing a jar flat partially over the mouth of the jar helps a lot. The dill seed will come out though and that is OK.
Bring the vinegar mixture back to another boil. Pour back over the cucumbers. Seal the jar with a flat and jar ring. Turn over the jar and let stand 15 minutes. Store for 6 weeks before opening so the pickles will develop really good flavor. If you are making a lot of pickles, you can process them in a water bath. After pouring the vinegar over the cucumbers the first time, seal the jars and process for 10 minutes in a water bath canner. It works, but the pickles never seem to come out crunchy.